This tool is used to select a portion of a image automatically. We can also select an uneven shaped area of a picture by using this magic tool. This tool picks of the color pixel and identifies the boarders of the color range and creates a selection. 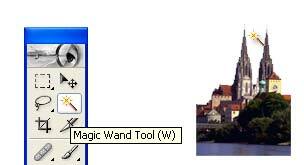 Magic Wand tool is used for selecting purpose only,but this tool is somewhat different from other selection tools like marquee tool. Here there is no need to draw any outline. We can select by single click only. This tool is below the Mark Tool. 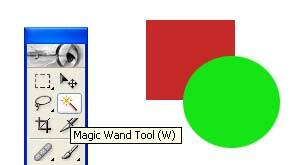 The magic wand tool lets us select a consistently colored area. 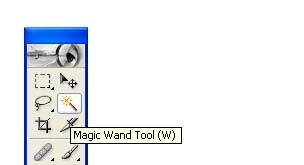 We must specify the color range, or tolerance, for the magic wand tool's selection. For example take two shapes,square and a circle one over the other of different colors. If we want to delete or edit the orange color, just select the orange color by clicking the magic wand tool over that color. Now by this tool only orange color will be selected. Now we can change the color of selected area or delete it. Similarly if we want to delete or edit the red color, just select the red color by clicking the magic wand tool over that color. Now only red color will be selected. Now we can change the color or delete it. Here is one more example. 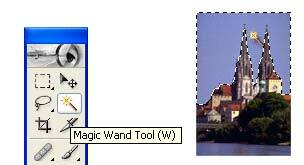 Select the magic wand tool and to select the sky in the image just click on blue color. Now we can see that only the particular blue colored area will be selected. If we want to delete the selected area, then just press delete key.